My mom is the kid at the back of the bike, aged six. She died 15 years ago from breast cancer, but it still feels like yesterday. My oma died last June and my uncles (one on the front of the bike, one in utero) are alive and well :) Photo and uncles are in the Netherlands. Of course. I was born here in the US, in Santa Barbara, California. However, I think of my mother’s birthplace as the motherland. It’s certainly the motherland of family bicycling. Did you have a good Mother’s Day? I hope it included an activity of your choosing, especially if that activity was biking. 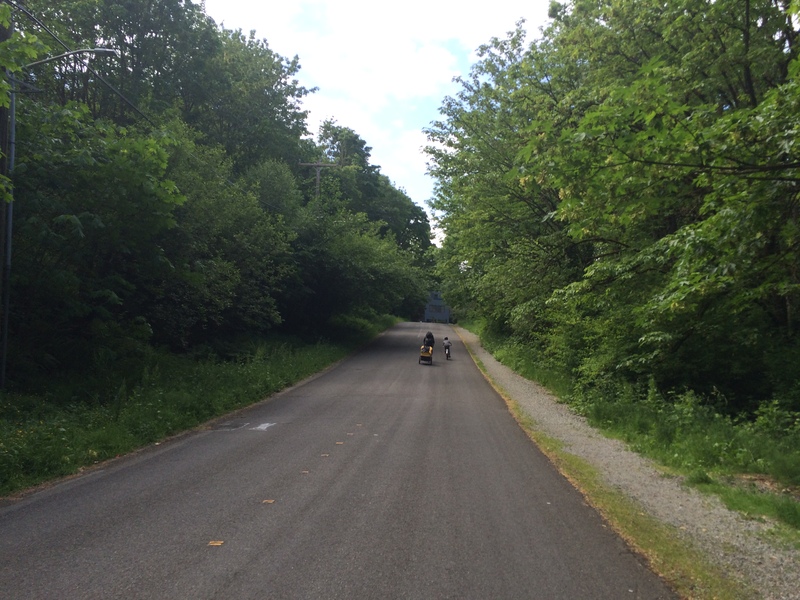 I got to go biking as well as get around to moving my laundry from washer to dryer so it was a pretty awesome day. 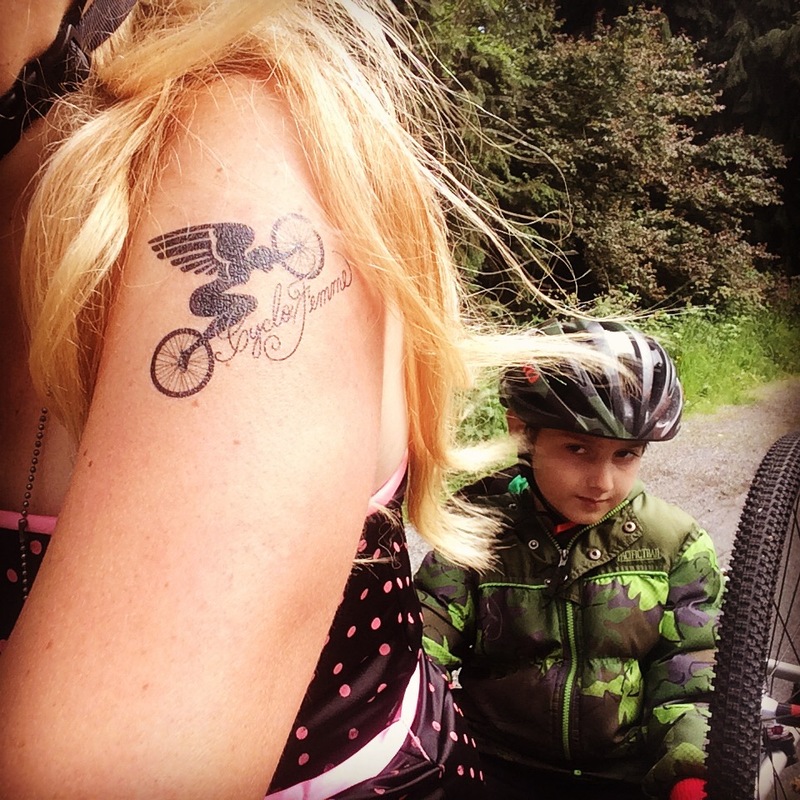 These last five years, Mother’s Day has meant CycloFemme for me. 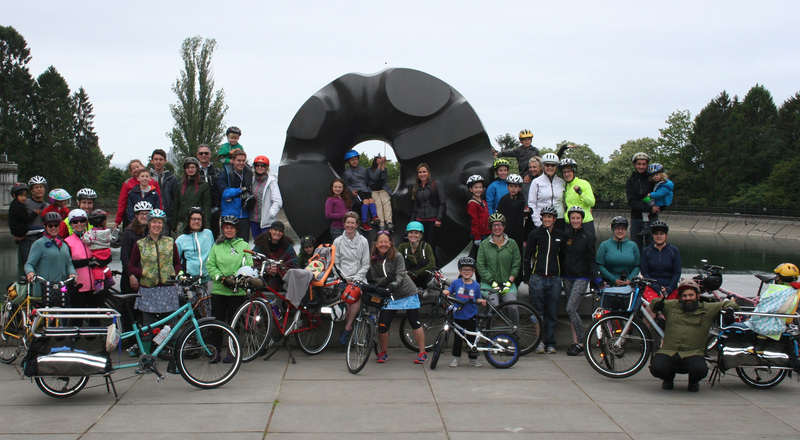 We formed Seattle Critical Lass to coincide with the first CycloFemme event and it’s been going ever since, encouraging more women to ride bikes in Seattle. 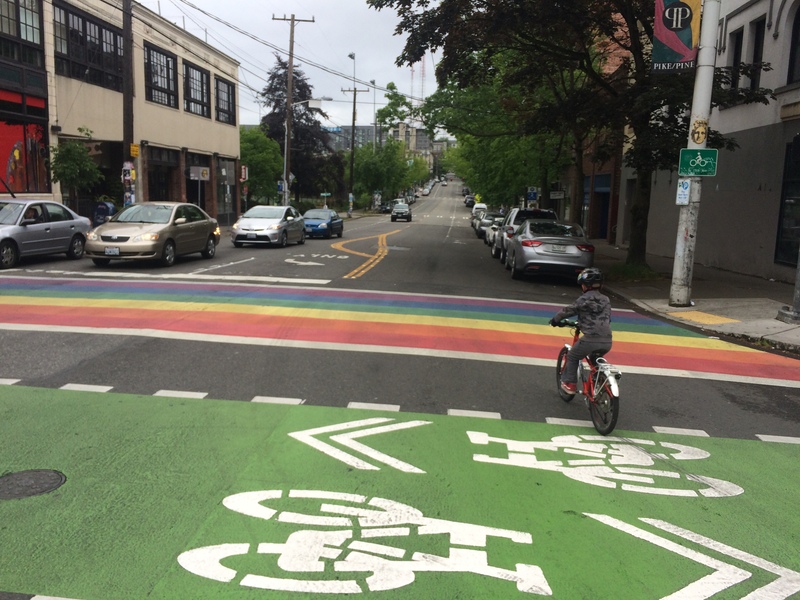 This year’s Seatle CycloFemme was big fun. 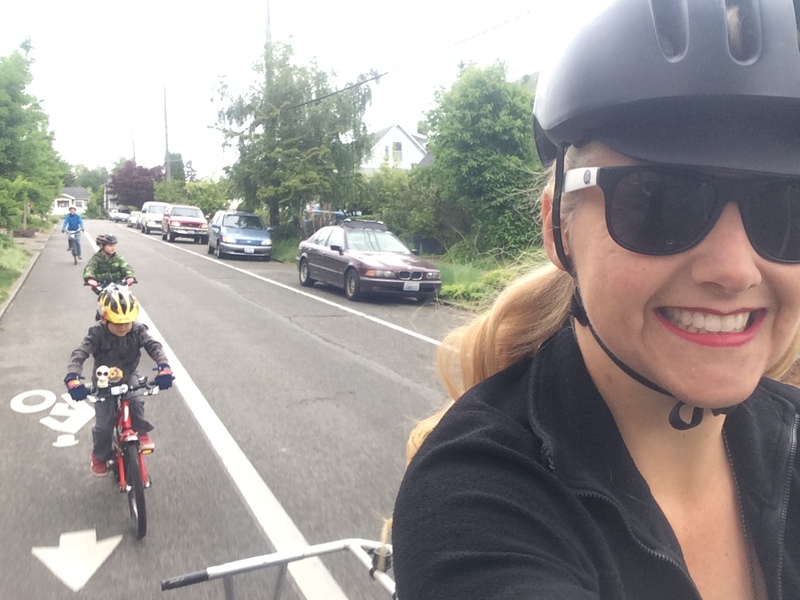 My friend Jen is in the process of moving back to Seattle, but her bike is still out on the coast so she ditched her own kiddos for part of the day and walked over (we’re in the same neighborhood now!) to borrow my Surly Straggler and ride with us. (She claims that five people came up to her over the course of the day and asked just who she was that she got to ride my bike, but I’m not sure I believe her!) Having an extra mom on hand is AWESOME and made my morning a lot mellower than it would have been otherwise. And then once we all got home. she walked my kids to the park 30 minutes ahead of me and Pixie and I got my Mother’s Day wish of finishing laundry and cleaning up a bit while no one punched his brother. Heaven! THANK YOU JEN! We had 55 people on our ride and everyone had fun. I had a great time, but I always leave these big events wishing I could have spent more one-on-one time with each person. My kids had a great time. My six-year old loved the ride. He’s recently decided he wants to be a bike racer so I let him charge ahead when it was safe enough. On the way to the ride he raced uphill on his own, but we rode part of the way back with a dad who raced with him. My nine-year old likes bikes, too, but isn’t quite as rugged so I loved it when I got to carry him most of the way home. I do live to carry stuff with my bike, after all. Also, his many “bail outs” (he’s a military spy and has to practice jumping off his moving bike repeatedly much to my dismay) left his handlebars askew and I forgot my multitool so I clenched his forks between my knees and muscled his bike straight. In a strapless dress. Good times. Mothers make it happen on Mother’s Day. No job too dirty. Being surrounded by awesome biking people and the gift of coffee, doughnuts, and lunch from Public Bikes Seattle and gorgeous flowers from Detours made this day THE BEST. ← Today was Bike to School Day?